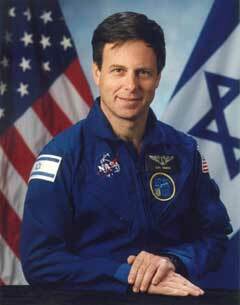 Ilan Ramon was not the first Jew to travel outside the earth’s atmosphere, but his voyage was certainly the most special for us. He was the first to go not as an individual, but as the representative of the entire Jewish people. That is why, although he did not identify as an observant Jew, he insisted that NASA provide him only kosher food. He hung a mezuzah on one of the portals of his capsule. In his bag was a book of Psalms and a dollar bill from the Lubavitcher Rebbe. As he passed over Jerusalem, he said the Shema Yisrael. And the whole world watched as he lifted a small Torah scroll that had miraculously survived Auschwitz. Why the Almighty took him and the other six astronauts from us as He did, I will not even venture to know. But I must admit that, in so many ways, I envy him. Sure, I envy all those who get to travel to outer space—but nobody ever carried anything like his kind of baggage. You could say that he took an entire nation—3400 years of history included—to the heavens. Proving that none of us, no matter how far we may journey, ever goes alone. And he knew he was all of us. He felt it to the bone. All their memories and memorabilia, their suffering and their victory. There is hope, for we are one. There is hope for all our planet Earth. Ode to Ramon Oh how i wish i could have met such a special man. I am so very lucky to have such a wonderful Rabbi Who (was Ilan Ramon's Rabbi as well) has made us happy to be Jewish people living out in this non-religious town. Ode to Ramon This is entirely beautiful. Inner space and Outer space do connect and the poetry of what is writte here, does say it all. Ode to Ramon Thank you so much for this beautiful insight. I am ashamed to say I had never heard of him, and of course the significance. Ramon I read it all, Rabbi Freeman, and it touches me so much, that my eyes are still filled with tears. He was really not on his own, he was there with all of us, Am Yisrael. I liked the ode. And I liked that all were united, No matter what affiliation, we were one. We owe it to Ilan The Lubavitcher Rebbe said that the biggest tribute to a soul in Heaven is when we people here on Earth act properly and in the Rebbe's words, to do acts of goodness and kindness. Just take a mere momentary glance at the world around us, and there is evil darkness and hatred everywhere, especially from the terrorists, G-d forbid. Ode to Ramon Thank you for the beautiful and touching ode. Surely G-d views Ramon as observant, from the "eleventh hour" through Eternity. May all Jews take to heart their duty to let go of any arbitrary criteria, and love all Jews.